which is the intent of the artist.Â All the plants and flowers Carlisle creates for these lush gardens are fictitious, and simply created through the process of playing with color and design.Â Carlisle’s art is traditionally optimistic in nature. 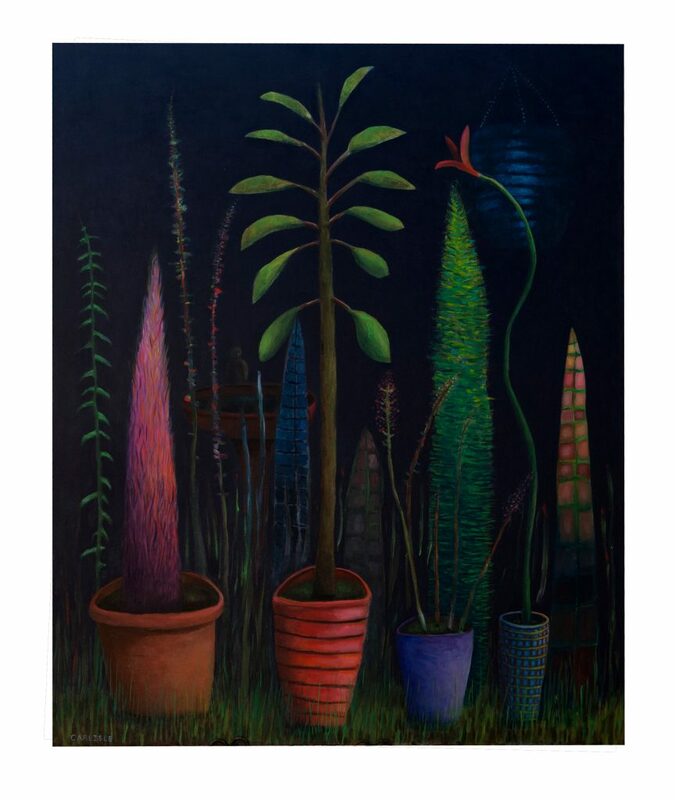 In “Night Garden #4” he utilizes a full palette of colors thus maintaining his vision of bringing a positive visual experience to the viewer. The idea of meditation and contemplation play a major role in the paintings of artist Craig Carlisle. His paintings articulate indelible images “I never use humans as reference for my paintings, instead I create fictitious characters. Through these, I channel the emotions each of us experience in our daily lives.” says Carlisle. which evoke an emotional response from the viewer. The series of Big Heads are generally large canvas’s deliberately created on a scale that will empower a room. Each expression Carlisle creates in his paintings are meant to pull from one’s subconscious. The Big Head is typically anonymous, and always genderless, almost child-like. Carlisle opts to place the focus for the viewer on the expression of each Big Head, thus eliminating the personal style we create for ourselves with hair or fashion.”I never use humans as reference for my paintings, instead I create fictitious characters. Through these, I channel the emotions each of us experience in our daily lives.” says Carlisle.Carlisle’s series of Big Head paintings he created in the early to mid 90’s helped him become a deeply respected artist who is an original visionary. 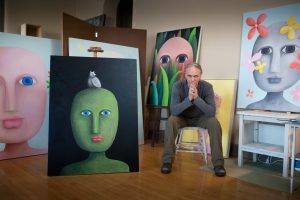 Though the Heads have seen many expressions and stylistic changes over the past two decades, they remain unique and highly sought after by art collectors.Â His Garden series equally matches that of the Big Heads in vibrancy, intensity, color, form and emotional depth. The perspective the artist uses with each Garden allows the viewer to feel as if they are standing within the space he has created. The plants, flowers, and all organic imagery Carlisle paints comes from his imagination with the intent of creating congruency with the viewer.